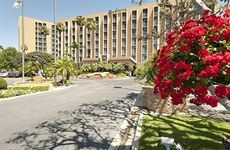 Find Hyatt Regency John Wayne Airport Newport Beach deals, discounts and special offers. The hotel provides a smoke free environment, and access to Tiffany’s Restaurant, serving fresh California cuisine. 440 rooms at Fairmont each have flat-panel TV; also an urban spa, rooms with soaking tubs, and a fitness center. With a full-service spa the Hyatt Regency features richly appointed rooms, bay views and casual dining. Each luxury room at this hotel has a step out balcony and oversized marble bathroom. Styled after an Italian villa, right on the waterfront, Balboa Bay guests enjoy full-service spa, &heated swimming pool. Each room in the Island Hotel features step-out balconies or patios in its suites & rooms, for business or leisure. Newly remodeled beach hotel with a new spa, luxury rooms and event space. Newport's closest hotel to the beach, this inn features bright, coastal decor and use of bikes and beach gear. Located across from the beach, the Best Western Hotel Solarena features a complimentary continental breakfast.